Get answers to common questions about participating in a SPEEDVEGAS experience. None! This experience is open to everyone. 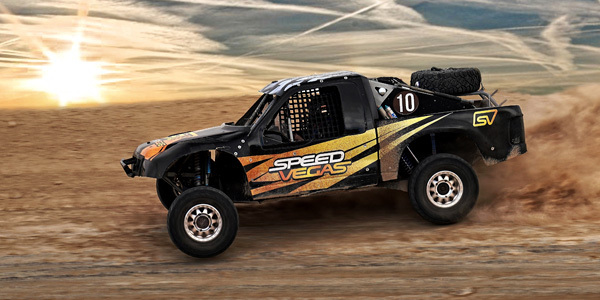 There are no specific weight or height restrictions for participation in the SPEEDVEGAS experiences. However, most of our exotic cars have limited headroom and are fitted with factory-provided racing seats, which provide lateral support. It is our experience that drivers over 280 lbs or 6'5" or taller may be uncomfortable. We advise that if you fall into this category it is better to call us before booking an event. Drivers need to be at least 18 years old. Drivers must be able to drive the cars without the aid of special equipment. Do I need to know how to drive a manual? No. All of the cars in this experience have an "automatic mode" where the clutch and gear selection is handled by a computer. You can also choose the F1-style paddles to operate gear changes. Some also use "sequential manual gearboxes," or triptronic shifters. This new E-Gear technology is found in many new high performance cars (including some FormulaOne cars), and is a manual gearbox where the clutch and gear selection is handled by a computer when you pull the gear change paddle. Sport casual is ideal. The pedals on some of the cars are close together, so open-toed shoes (such as flip-flops and heels) are not permitted. When you arrive, we will provide a helmet for you at no additional cost. Cameras may not be mounted outside the cars, or used by you while you are driving. Lockers are available at the SPEEDVEGAS facility to store your belongings. Can I bring a passenger or guest? Sure! You may bring family or friends to watch your experience. Our second-story viewing terraces provide a terrific vantage point of the entire complex, and refreshments are available in the cafe. 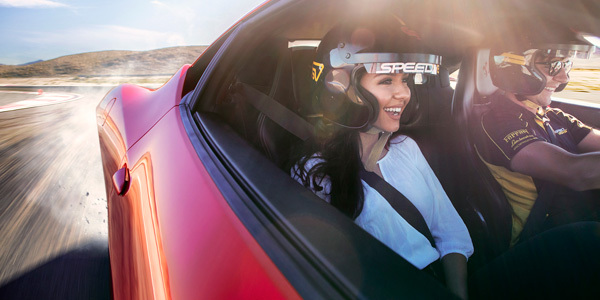 Your guests won't be able to ride along with you on the track, since a SPEEDVEGAS coach will be riding in the passenger seat during the driving portion of your experience. Our cafe´ offers a selection of light fare and drinks that can be enjoyed inside, or outdoors on the viewing terraces. For larger events, our on-site catering facilities offer a wide array of options to meet food & beverage needs for groups of any size. In addition, the M Casino is located just two miles from SPEEDVEGAS on Las Vegas Boulevard, and offers thirteen fine dining, casual dining, and bar options. Drivers must be at least 18 years old, and must hold a valid driving license in the country of their residence. Passengers of any age may ride along, as long as they weigh more than 60lbs (20kg), are older than 6, and are able to ride without the aid of special equipment such as booster seats. We include free pickup and drop-off at most major hotels on the Las Vegas strip. Complimentary shuttles run approximately every 30 minutes. Simply stop by the host desk after your experience to arrange details. Get more information, including instrucciones de conducción and information about shuttle, limousine, and helicopter options aquí. Helmets are required for all participants during the driving experience. A helmet will be provided to you to use at no additional cost. We recommend allowing at least two hours for your entire experience. However, please allow an additional time if you plan to drive more than 10 laps or more than 2 vehicles. The first lap begins when you exit the starting lineup/pit lane onto the track. When the car passes the starting grid on the front straight, your second lap will begin. Your final lap will end when you pass the starting grid. After completing your laps, you'll continue around the track, exiting at the pit lane. This helps us cool the car down before returning to your starting position. This means that you will travel down the front straight for 5 times during a 5 lap experience. 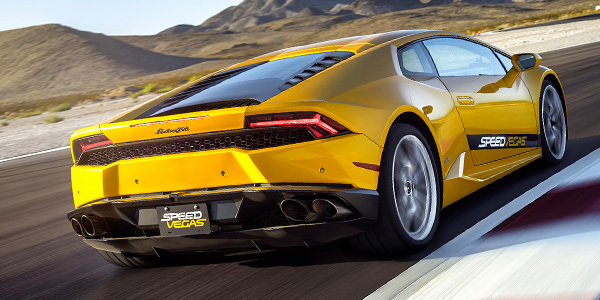 During a 5 lap experience, you'll drive a total of 9 miles (14.5km). Get answers to common questions about making your SPEEDVEGAS experience reservation. Walkups are warmly welcomed on a first-available basis. However, we recommend that you reserve your vehicle and timeslot, as many sessions sell out in advance. We stand behind our experience. If there is a problem, we'll work with you to fix the issue. If we can't solve the problem, we'll refund you. You can transfer your booking to another driver at any time. You may also reschedule your reservation to a future date prior to your scheduled event. Insurance is included in the experience at no additional cost. Drivers must be at least 18 years old, and must have valid driving license in the country of their residence. Passengers of any age may ride along, as long as they weigh more than 60 lbs (27kg) and are older than 6. Get answers to common questions about SPEEDVEGAS Gift Certificates. Our Gift Center offers gift certificates in denominations from $100 and up. When you purchase a Gift Certificate, you (or your lucky recipient) will receive an instant digital download which can be used toward any SPEEDVEGAS driving experience. Gift Certificates may be redeemed in person, by telephone, or when buying a SPEEDVEGAS driving experience onmline. During checkout, simply enter the Gift Certificate Code printed on your Gift Certificate into your shopping cart, and the full value of your Gift Certificate will be applied to your order. Your recipient can use the Gift Certificate for any future SPEEDVEGAS driving experience. Yes! Gift Certificates may be redeemed by anyone, and are valid for any SPEEDVEGAS driving experience. You or your recipient may gift the Gift Certificate to another person without penalty. Do SPEEDVEGAS Gift Certificates expire? Your SPEEDVEGAS Gift Certificates are valid for two years from the date of purchase, unless otherwise prohibited by law. The expiration date is printed on the Gift Certificate. Nuestro premiado equipo de servicio al cliente está preparado para contestar sus preguntas. Siéntase libre de visítenos, llamarnos, visitarnos, twittee, Facebook, chatear con nosotros o enviarnos un telegrama. Hemos recibido su correo electrónico y en breve lo responderemos.